Welcome to October and welcome (back) to Camper Cats. Our summer flew by, in a blur of work and travel, and we realize we are long overdue for an update. So today’s post will be a bit different than usual, as we’d like to recap our summer (to explain why we haven’t been around) and share some of our big plans for Camper Cats and for ourselves. So let’s get started! Our most important news of the summer is that Andrew has finished his MBA at Solvay in Brussels! After two years of working full-time during the day, and going to classes just about every night and weekends, the diploma will be in his hands on Saturday. I couldn’t be more proud. We’re also very excited, as this signifies the beginning of a new phase in our lives. For the past two years, we’ve had to postpone travel (although we still managed to travel quite a bit), planning our future, and working towards our full-time RV goals. Now we need to put those regained evenings and weekends to work, by finding some income streams to sustain us while we travel and (the fun part) plan for our upcoming adventure. But I’ll get to that in a bit. Despite Andrew’s heavy work load we did manage to travel this summer. 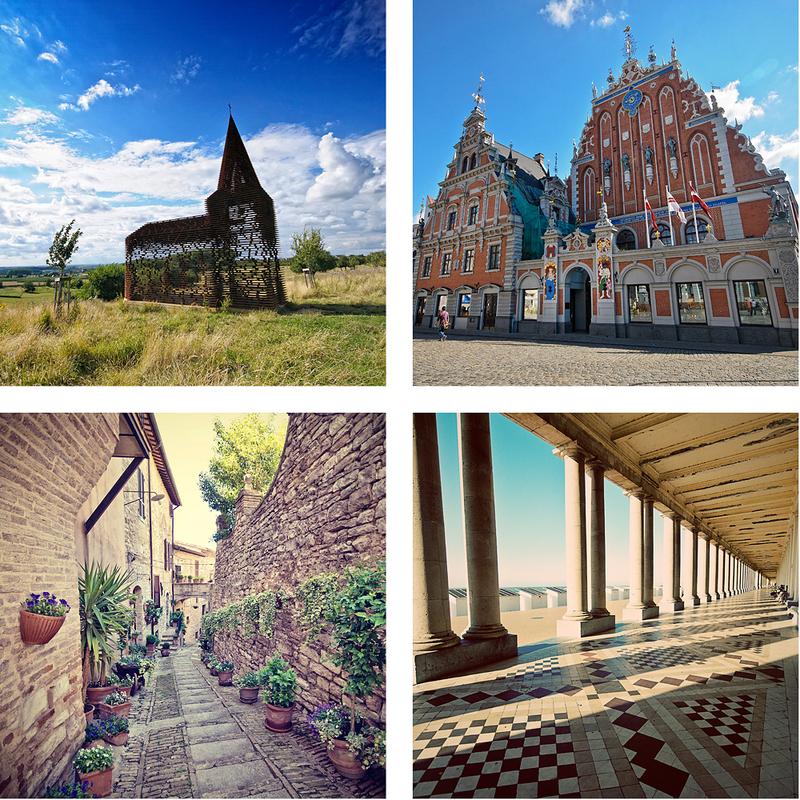 After our big trip to Hong Kong and Borneo in the spring, we stuck to shorter trips around Belgium and Europe. We made a last minute jaunt to Spello in Umbria, Italy to visit some new friends. This is definitely a region we would LOVE to explore in our motorhome. There are plenty of little twisty roads, picturesque villages and space to park our home on wheels. I also tagged along with a dear friend in Brussels to visit her Grand-Mother in Latvia. (Yup, I snagged another UNESCO site on the way!) Latvia looks like heaven for motorhomes. The coast is stunning and the highway seemed flat, straight and well maintained. There was even a brand new campground close to Grandma’s house at the beach. (See the blissful beach in the headline photo.) Perfect! Highlights from our summer travels: (Top) Reading Between the Lines art installation near Hasselt, Belgium, Riga, Latvia, (Bottom) Spello, Italy, Oostende, Belgium. The rest of our escape weekends were spent right here in Belgium. We discovered plenty of things to do (and eat) in both Hasselt and Oostende. I’ve also just returned from two press-trips in Belgium: one in Antwerp, with Visit Flanders, to take part in the opening of the Red Star Line Museum (not to be missed) and the other to discover sustainable tourism in Wallonia. I’ve got plenty of stories in mind from both of these trips so stay tuned over on CheeseWeb.eu. The final highlight of our summer was a quick visit from our friends Warren and Betsy of Married With Luggage. These guys have been our driving motivational force to figure out exactly what our dream is and then go for it. You’ll be hearing a lot about them on Camper Cats as we continue to follow their example. While they were in town, they interviewed us for their fantastic podcast – An Action Plan for Dreamers. For those of you here because of that interview, welcome! I hope you stick around and sign up for our free newsletter because we have lots of great things planed. First up, we’re heading home to Canada to spend October visiting our families and (hopefully) enjoying a little R & R. We’ll be doing a lot of travelling back and forth, so we hope to use some of the flight time to plan our strategies for creating income streams to sustain our motorhome life. We’ve already started talking about some of the things we want to do with Camper Cats and they include adding a video element, interviews with other full-time motorhomers, and sharing the resources we’re using to help us move toward our dream. As you may have noticed in the side-bar, we’ve added a newsletter signup to the site. After our return from Canada we’re going to be putting some resources and other goodies together in a monthly newsletter, so don’t miss out. When we return to Belgium, we’ll be heading into RV Show season. 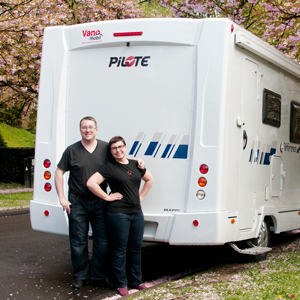 Although we’ll likely be buying a second-hand motorhome, we find these shows valuable to make contacts with dealers, and discover what would and wouldn’t work in a motorhome for us. We’ve also embarked on a HUGE decluttering project which we’ll be sharing in detail here over the coming months. It’s incredible the amount of stuff we’ve amassed over our 8 years in Belgium and most of it will need to go before we hit the road. 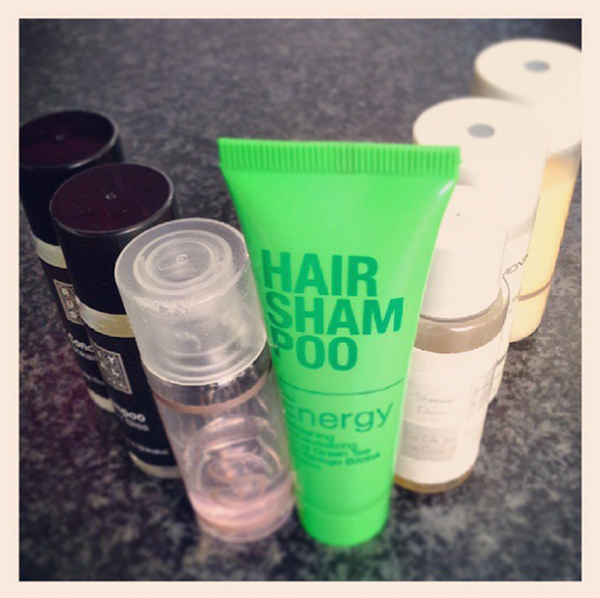 You may remember our first decluttering and money-saving challenge – The Toiletry Task. Over the summer we vowed not to buy any more toiletries until we used up all of the travel-sized bottles we’ve picked up from hotels. So far, so good. We’ve only had to buy one bottle of shampoo each and since that purchase we’ve had more hotel stays… so more little bottles. The pile of lotions is slowly diminishing and we’re working our way through the soaps too. I have plenty more decluttering and money-saving challenges in mind. I hope Andrew is ready for them! We have 948 days until we hit the road (and we’re hoping we can move that deadline even closer) so we have lots of work to do before then. I hope you’ll stick with us for our journey towards freedom and help motivate us to stay on track. This is WAY too exciting! I can’t wait to follow your journey! Love the blog name too!! Thanks Mary! We’re super excited! WOW Alison, what a dream!! I will follow! Thanks Roni! We can’t wait to begin!